I made this for our dessert after dinner this evening. Weather is getting warmer recently. So, this chilled fruits dessert comes in great! 1) Pre-boiling of tiny pearl sago: Place sago into a pot of water, and place the pot on stove to boil over medium-high heat. Let the sago boil for 5 – 7 minutes, or until it turns almost transparent. Stir occasionally. Heat off and cover pot with lid to let it stand for another 5 minutes. Thereafter, drain sago on a fine sieve over running tap water. Place the cooked sago in a bowl of half-filled boiled water (about 50ml). Set aside. 2) In another pot, place sugar, pandan leaf bundle and 50ml of water. Cook sugar into syrup over low heat. Remove pandan leaf. Set sugar syrup aside to let it cool. 3) Place chunky honey dew and 200ml of water into the eletrical blender and blend into honey dew juice. Pour juice into a large serving bowl. Stir in sugar syrup and coconut milk. Then, spoon sago into the coconut milk solution. Lastly, add in honey dew balls. Stir gently to well combine all ingredient. 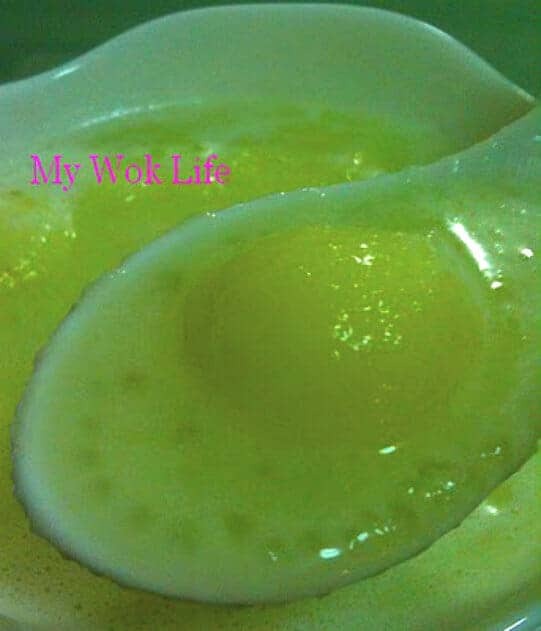 Place honey dew sago dessert in the refrigerator to chill. Serve chilled. A bowl of my honey dew sago dessert counts about 180kcal. More options: If you do not like coconut milk, try adding evaporated milk instead. It works as well! Simply add 200g of evaporated milk to replace the coconut milk. Tips: It’s ok if you prefer to use powedered-form coconut milk. Stir the coconut milk powder directly into the honey dew juice, after adding the sugar syrup. * Not to worry if you find some foamy scums on the honey dew juice after blended it. It’s OK, it will disappear after awhile. * If you need to serve an instand chilled honey sago, add ice cubes into the blending. Reduce water addition to 150ml and add in about 10 ice cubes and blend together with the honey dew chunks. * Amount of coconut milk can be adjusted to the taste and thickness in the texture of the dessert soup you want. Add the coconut milk gradually till reaching your desired texture. ← My Lo-Hey Ceremonies in the Year of 2011!